Road Tripper - Cars! Cars! Cars! um ya wat happens if u get in a crash u glass stuck on u because it busted o wait its a nissan wed die anyway. 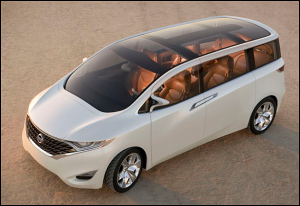 "How great would this minivan be going from Brooklyn to CA?" It would be hot! Yes, literally! If are to travel on interstate freeways, the sun's UV rays would shoot across the glass.